Rehabilitation for seniors is necessary following an illness or injury and is extremely beneficial to improve mobility, balance, and strength, as well as increase cognition and communication skills. The main goal of any rehabilitation program is to restore the individual to the level of independence they are accustomed to. Following a hospital stay, many seniors will start a rehabilitation program to help get them on the road to recovery. The rehab may include physical therapy, occupational therapy, speech therapy – or a mix of all three. Physical therapy: Increases mobility, reduces pain, restores functionality and improves overall health. Occupational therapy: Encourages the re-learning and improvement of fine motor skills, strength, and dexterity; restores abilities to perform basic activities of daily living. Speech Therapy: Increases functional communication, cognitive skills and teaches safe swallowing by introducing diet modifications and special feeding techniques. 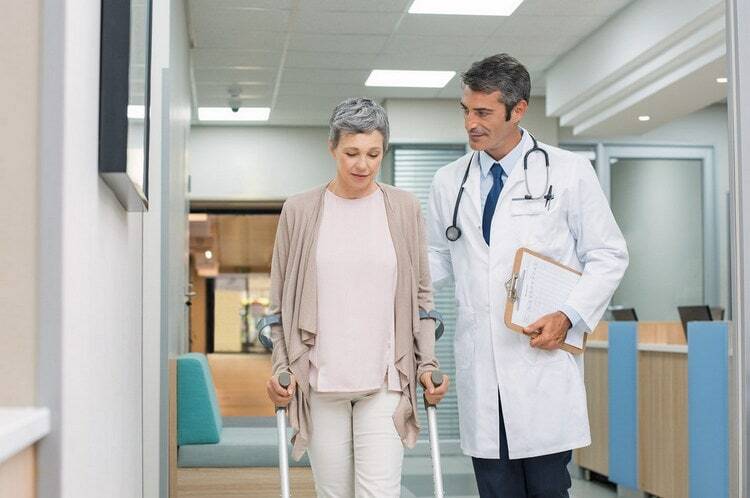 In general, addressing injuries like bone fractures, neurological disorders due to head injury or stroke, surgical wounds spinal cord injuries, or chronic conditions like arthritis or back pain requires one of two kinds of physical therapy: Inpatient rehabilitation or outpatient rehabilitation. Ultimately, a physician will advise the type of rehabilitation that is most likely to help individuals regain as much independence as possible. Choosing one or the other depends mostly on the severity of the injury or illness, along with how much therapy is required for the best possible recovery outcome. Staying on campus at an inpatient rehabilitation center allows the individual to focus solely on his or her recovery. It’s a more intensive option that generally includes daily physical therapy, occupational therapy, speech and language therapy and even aquatic therapy when needed. Individuals stay within the center for a pre-determined amount of time, whether it’s just for a few days or up to a month or more if longer-term care is warranted. However, many inpatient rehabilitation centers offer a variety of services and amenities designed to make life as comfortable as possible for the residents throughout their stay. For instance, fully furnished, private suites, delicious dining options, spacious common areas, and social activities– all combined with the right amount of therapy to restore the highest level of independence. It’s important to note that inpatient therapy might be a lengthy commitment. But, the intensive therapy allows individuals to possibly meet their recovery goals in a shorter amount of time than an outpatient rehabilitation program. One of the main benefits of outpatient rehabilitation is that individuals may return to their own homes after therapy, rather than stay within the rehab center. Outpatient rehabilitation services include physical, occupational and speech therapies from the same type of highly-trained professionals available at inpatient rehabilitation centers. However, sometimes outpatient rehabilitation does not produce the same quality results as inpatient rehab. This is due to the fact that individuals are in control of their own recovery and how fast they progress; they must be motivated to continue their therapy off hours at home in order to benefit as much as they would from inpatient rehabilitation. Still, for some, when less intensive therapy is needed, outpatient rehabilitation can be a beneficial, less time-consuming option. Get back to health with Peabody’s Rehab to Home program, where our goal is to get you back to living life on your own terms. Our physical, occupational, speech and aquatic therapy services are available seven days a week, focusing on restoring health to both older adults and seniors alike. For more information about our inpatient rehabilitation center, please contact us today by calling (260) 982-8616.